​Klay Thompson is one of the greatest shooters in basketball history. When he catches fire in a game, he's arguably the most dangerous man in basketball-- just ask the Kings, who watched him put up an NBA record 37 points in one single quarter back in 2015. And now, ​the son of Mychal can add another accomplishment to his ever-increasing list: after hitting his 1,686th career three-pointer Tuesday night against the Lakers, he has now surpassed ​LeBron James and Hall of Famer Steve Nash for 19th place on the all-time list. 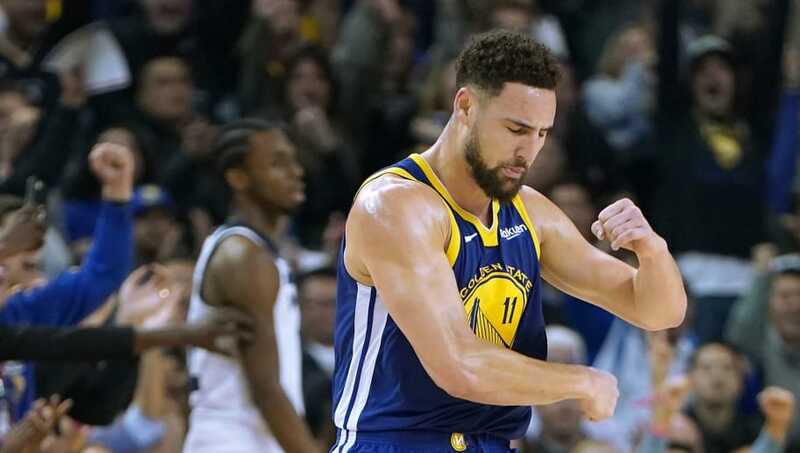 With two three-pointers tonight, Klay Thompson (1,686 career threes) has passed both LeBron James (1,684) and Steve Nash (1,685) on the NBA's all-time threes list and now ranks 19th in NBA history in the category. The 28-year-old Thompson already has three ​NBA titles, four All-Star appearances, and two All-NBA nods to his name, and it's not so hard to imagine him finishing his storied career right behind teammate Steph Curry for second on the career charts for triples. With this #SPLASH💦, Klay passed both LeBron James and Steve Nash on the NBA's all-time made threes list. Yes, he can play some mean defense, too. But when the histories are written, Klay will be inextricably linked with the three-ball. And he can't be particularly mad about that.